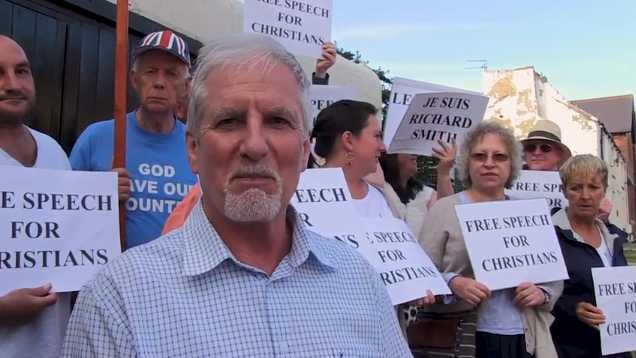 FERRYHILL, U.K. — The mayor of a town in the United Kingdom has resigned after being harassed with threatening and profane comments over his Facebook posts on the issues of homosexuality and transgenderism. Richard Smith was elected in May to serve as the mayor of Ferryhill in Northeast England. He has served as pastor of Immanuel Christian Fellowship since 2003, a church that regularly hosts a free food distribution for those in need. Smith was also active in the military for eight years. According to the BBC, another post opined that transgenderism has produced “large scale child abuse,” and a third lamented that “people aren’t allowed to speak the truth anymore” when it comes to gender dysphoria. Smith also shared his views about Islam. The drag queen, who goes by the name Tess Tickle, reportedly accused Smith of homophobia and Islamophobia, which resulted in a number of other comments of outrage from those who took issue with Smith’s words. “Everybody’s entitled to their own views and beliefs. However, sharing things in a public domain in a position of power—it’s not acceptable,” Tickle told the BBC. Members of the Ferrytown Town Council also planned to cast a “no confidence” vote, which would essentially force Smith to resign. However, before they did so, Smith submitted his resignation as mayor. “The latest incidents being the mob getting my son involved who is an Afghanistan War Veteran who suffers severe PTSD with severe flashbacks. I had to refrain from attending the flag raising event where I was to give a speech for those of our serving military men and women; this was due to the threats of disruption to that and any event I would have been involved in as town mayor. It has got so bad I now have involved the police,” Smith outlined. He lamented that he felt he had to resign, and said that his words had been “twisted,” noting that he has has always offered help to anyone who needed it, regardless of their lifestyle. “People who really know me and Lauraine and the church can truly comment on how hard we have lovingly worked to help and provide for those in need, this has now been decimated by the minority mob along with those wishing to score political points and who have a God-phobia,” Smith stated. “I guess nothing much has changed. I get called a bigot and intolerant?” Smith asked. He will remain a councillor, and will continue to also serve the community as a pastor.